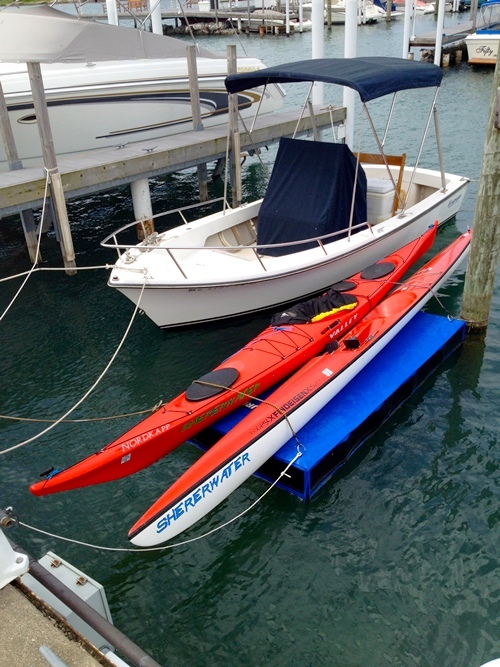 Why choose Dock for your Inflatable Boat or Kayak from BoatsToGo.com? HomeBoatsToGo - Blog About Inflatable Boats, Inflatable Rafts, Inflatable Kayaks And More...Why choose Dock for your Inflatable Boat or Kayak from BoatsToGo.com? I am fortunate enough to live in a house where my backyard opens onto a lake. I say fortunate, because not everyone has the opportunity to live in a situation like this. But truth be told, finding a house on the water was a major priority for me because of my love of boating. Whether it be my trusty kayak that I use as a great way to keep in shape, or my inflatable boat that I take out for leisurely days of fishing, I am forever putting boats in and out of the water. One major issue with the property I live on, however, is that there is no dock for my boats. My initial thought was that I would have a dock constructed. But that idea changed as soon as I saw the price tag. Next, I decided that I would just drag my boats in and out of the water every time I wanted to use them. Now with lightweight inflatable boats, this is at least somewhat feasible in the short term. But it gets old really fast. So I started to do some research, and that’s when I came across this amazing new product. It is a small, floating dock that fits all of my needs. It’s cost-effective, easy to install, durable, and can handle all types of small boats like canoes, kayaks, and inflatable vessels. Getting this boat dock up and running is a very simple process. It is basically a heavy-duty shell made out of a high-tech tarpaulin PVD material. The shell is equipped with narrow openings that are perfectly designed to fit 4 Styrophoam panels. These panels are what act to keep the dock afloat, and can be cheaply and easily bought at your local hardware store. I bought mine at Home Depot for about $15/pc. You just slip the panels inside the shell, seal up the opening with the convenient Velcro flaps, and you’ve got yourself a dock that can be attached to basically anything. It’s just that easy! This dock offers a few other great features. First off, it comes with 4 D-rings installed at the edges that allow easy attachment to whatever you want to anchor it to. These rings also can be used for a few other things, one of which is to actually secure the watercraft to the dock. The other, even more interesting use of the D-rings, is that they can be used to attach multiple floating docks together. This would allow you to store more vessels or bigger vessels easily. You can literally attach as many of these docks together as you want, creating space for all your boats. There are a couple more bonus uses for these floating docks. Number one, your dock can double as a perfect work platform when you need to clean or fix issues with your boats. I know this has come in very handy for me on many occasions. Number two, you can actually install plywood through the foam layers to make the dock sturdy enough to handle a heavier vessel like a Jet Ski. And now you have a Jet Ski dock for an incredibly low price!